Manure. You know what it is. Animal waste. It will often include the straw, hay, or wood shavings that are used as bedding for the animal and has absorbed the farm animal’s feces and urine. It’s been used for centuries as a slow-release fertilizer for farms and gardens. Using manure in your garden builds organic matter, adds nutrients to your soil, and helps to increase microbial activity. It improves soil structure, drainage, and moisture retention. The nitrogen in manure is not all immediately available. When soil organisms begin the decomposition process that nitrogen then becomes available. It’s a win-win situation with soil organisms and manure. They love each other. Adding organic matter like compost and manure yearly will result in more even nitrogen levels in your garden. I think the best kind of manure to use is the kind to which you have access. Some manure is higher in nutrients than others, and some are more likely to contain weed seeds than others. But they all have value and are worth using. The ideal situation is to use manure that includes bedding because the animal’s waste is nitrogen-rich and the bedding is carbon-rich creating a great balance. In addition, composted manure is best since it won’t burn your plants, and if composted properly, weed seeds and pathogens will be destroyed. That means the compost should reach 145° for several weeks and be turned regularly. If not composted, be sure the manure you use is aged at least 6 months. Cow – while cow manure may have a more balanced mix of nutrients than other manures, it is not the highest quality. But those 4 stomachs assure that weed seeds are broken down. Poultry – because of its high urea content, chicken manure is also high in nitrogen. But use it with care because it will certainly burn your plants if used fresh. Sheep or Goat – this manure is less likely than others to burn your plants and it is often used fresh. Still, to prevent disease it is best to use it composted. It will likely contain weed seeds and composting will help to deal with that as well. Horse – similar to cow manure in that it is not high in nutrients. Horse manure is sure to contain weed seeds unless it’s composted at 145°. This is the type of manure we most often use in our garden because it’s the most readily available. The farm where we get it composts it; you can see the steam rising from the pile in the video below. Rabbit – rabbit manure is higher in both nitrogen and phosphorus than other manures. And those little critters can produce quite a bit of manure. Used fresh, it will not burn your plants, but again I think it’s always best to use composted manure to reduce the risk of disease. Pig – using pig manure is controversial. Parasites like roundworm can survive the composting process, and seem to be more prevalent in pig manure than in other manures. I looked at several different .edu sites and the information is conflicting. If you raise your own pigs and have successfully used the manure in your garden, carry on. Otherwise, you may want to choose another manure. It is best to use composted manure. This is important for several reasons. Manure may contain pathogens like E. coli or Salmonella. These, along with weed seeds, fly larvae, and parasites are destroyed when the compost pile heats up to 145° for several weeks. Turning the pile is important as well. If you are unable to get composted manure, or unable to compost it yourself, use manure that has been aged at least 6 months. While pathogens are not actively killed by aging, aging does inhibit reproduction. And exposure to sunlight and drying help to reduce pathogens. Fresh manure should not be used since it is considered “hot” and can burn plant roots and leaves. Goat and rabbit manure are often used fresh because they do not burn, but it is still best to age even these manures to decrease the risk of disease. In addition, composted or aged manure will no longer be smelly. If you have close neighbors, they will thank you for that. We use only no-dig methods of gardening like lasagna-gardening and wood-chip gardening (both of which are considered sheet composting). Each fall, we add either 1″ of leaf compost or manure (aged, if not composted) to the top of each garden bed. This is then topped with a layer of hay or wood chips. In the spring, the top mulch layer is pushed aside and seed is planted in the soil below. 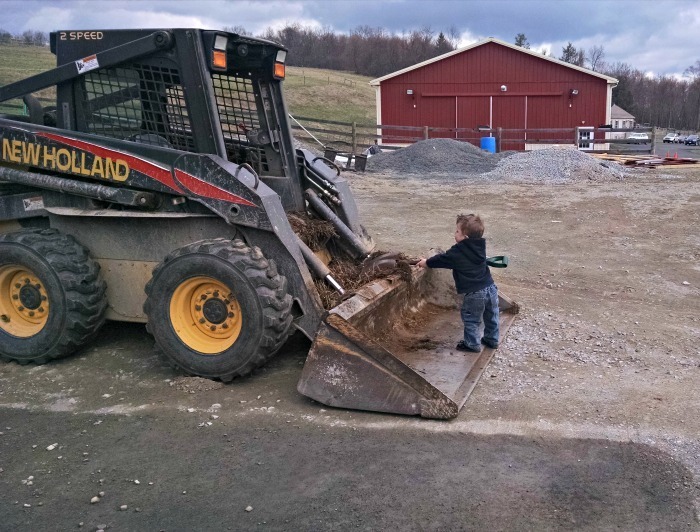 My great nephew Elias helping us get horse manure. I always recommend that you purchase meat from local farmers so you can ask questions. “Know your farmer” is a good policy when getting manure as well. You’ll want to ask some of the same questions you ask when you purchase meat. Most pharmaceuticals, like vermicides used to de-worm, degrade within 2 – 30 days. Many antibiotics and hormones do persist, however, and will show up not just in the manure, but in the case of antibiotics may show up in the vegetables that are grown in the manure. Have pesticides or herbicides been used? While the animals from which you are getting manure may be raised on pasture that does not mean that no synthetic chemicals were used. The residue of these pesticides or herbicides may show up in the manure. Be especially diligent not to use manure if herbicides have been used. Herbicides with the chemical compound clopyralid persist through the composting process and will cause damage to your garden plants. Some farmers spray their manure piles with pesticides to kill fly larvae. Ask. Hot composting is a much better solution. Fresh manure can burn roots because of its high ammonia content. Too much manure can lead to a build up of salts in the manure. Limit application of manure to 1″ per year. Except for the build up of salts, hot composting can eliminate all of the disadvantages of using manure in your garden. Just aging the manure can eliminate all but salt build up, and weed seeds. 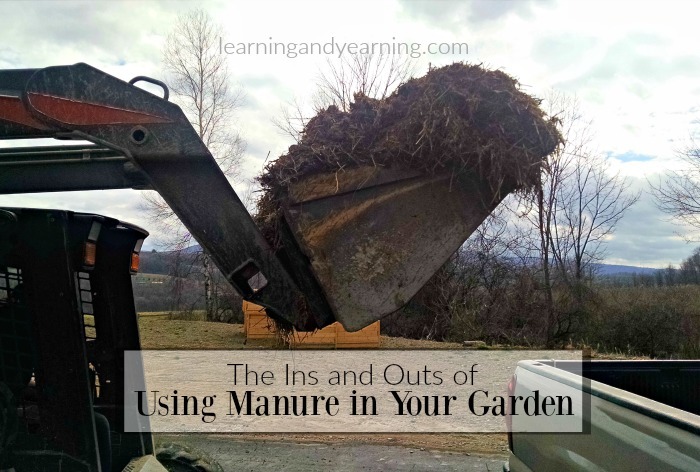 Do you use manure in your garden? What kind? Have you had problems? Occurrence of estrogen hormones in biosolids, animal manure and mushroom compost. Hi Helena, we have used horse manure for many years without any problems. Our farm uses our horse manure. Like all other manure , it should be well composted first . I find so many customers simply don’t compost correctly or long enough . Composting is somewhat of an art 🙂 ! Learned my lesson with Horse Manure the hard way. Still trying to get rid of the thistle. I started raising chickens in my suburban San Jose home three years ago. The chicken manure and straw bedding in my compost pile have supercharged the whole process. Plus, I know there are no chemicals and you can”t beat fresh eggs! I live in Ecuador and I do my compost with chicken manure but I never reached 145 F. It’s probably why I got an outbreak of roly poly/pill bug 2 years ago in the whole property. Even fruit tree trunks were eaten up by these voracious little shrimps. So my question is : what is the recipe to reach that quite high temperature in a compost pile? If it is an art is there a teacher somewhere? And Susan thank you so very much for your informative and easy to read newsletters and also your book. I am learning so much from you. Thank you for your sweet words, Daniele! First of all, be sure that your compost pile is large enough. A small pile will not generate the heat needed. If it still is not heating up, add more nitrogen – fresh grass clippings, blood meal, fresh manure, or even coffee grounds – this should get things going for you. And lastly, a dry pile will not heat up, so make sure it has enough moisture.